So, how about those Saints ! 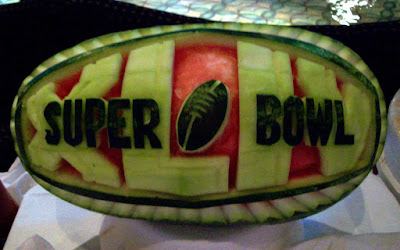 The ship was able to bring the game in on Satellite and they deviated from the normal Sunday at sea program and set up TV's in all the bars, as well as the main lounge, complete with finger food buffets outside the entrances and the party began at 6pm. (Only downside was buying our own drinks). It appears the majority of viewers (at least in the lounge we choose) were Colts fans. And, at that point in time when the game turned around and the Saints took the lead, the 5 of us fans in the room clapped, yelled, shook morraccas and generally had a great time. How about that Dreeewww Breeeeezzze ! How about those Saints ! The ship has a special coffee shop, like a Starbucks, where you have to buy the coffee (it's much better than that in the common areas). They also sell incredible cakes and deserts for a nominal $2.25. 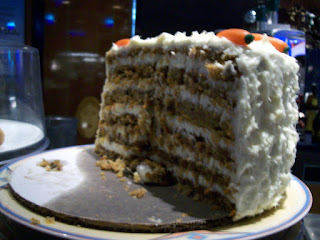 On our last cruise I had a piece of carrot cake (my favorite) that was well worth the kazillion calories that it, most likely, contained. Well, the Carnival Miracle had a cake just like it. I discovered this fact the first day and knew that I was going to have a piece .... just one. I passed the cakes several times a day carefully planning when the event was going to happen. Now, mind you, I certainly was not being dessert deprived. Wonderful deserts were being served at lunch and dinner, and I was frequently visiting the soft serve ice cream machines between meals. But, the Carrot Cake was calling me. So, half time during the Saints game I ventured over and bought one venti latte and one piece of carrot cake. Well, let's see, previous to this I'd had breakfast, lunch, snacks and the finger foods ... chicken wings, sushi, a hot dog, and I'm sure more that I can't even remember. I made a great attempt, but 30 minutes later and at half way through (the slice, not the cake), I couldn't do another bite and had to turn it over to waitstaff to take away. Next cruise, I'm going to eat the carrot cake on the first day ... before I'm already overstuffed with all that other stuff and can trully enjoy it! 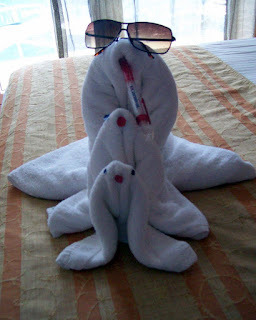 As usual, our room stewardess left us a delightful towel sculpture. Last night at sea of our cruise. But, how about those Saints !